Am I dreaming!!!! South Korean government has decided to put a robot in every home by 2020. I really appreciate the South Korean Govt for their efforts to use the technology in very productive manner. I want a robot in my home to do all the chores… What will you guys do if you have a robot at your home?????. South Korea, the world’s most wired country, is rushing to turn what sounds like science fiction into everyday life. The government, which succeeded in getting broadband Internet into 72 percent of all households in the last half decade, has marshaled an army of scientists and business leaders to make robots full members of society. By 2007, networked robots that, say, relay messages to parents, teach children English and sing and dance for them when they are bored, are scheduled to enter mass production. Outside the home, they are expected to guide customers at post offices or patrol public areas, searching for intruders and transmitting images to monitoring centers. If all goes according to plan, robots will be in every South Korean household between 2015 and 2020. That is the prediction, at least, of the Ministry of Information and Communication, which has grouped more than 30 companies, as well as 1,000 scientists from universities and research institutes, under its wing. Some want to move even faster. “My personal goal is to put a robot in every home by 2010,” said Oh Sang Rok, manager of the ministry’s intelligent service robot project. Reeling from the Asian financial crisis of 1997, South Korea decided that becoming a high-tech nation was the only way to secure its future. The government deregulated the telecommunications and Internet service industries and made investments as companies laid out cables in cities and into the countryside. The government offered information technology courses to homemakers, subsidized computers for low-income families and made the country the first in the world to have high-speed Internet in every primary, junior and high school. As with robots and most other specific technologies, the government has had a strong hand in guiding businesses and research centers. Failures have occurred � most spectacularly in biotechnology, when the cloning scientist, Dr. Hwang Woo Suk, was exposed as a fraud � but the successes are many. South Koreans use futuristic technologies that are years away in the United States; companies like Microsoft and Motorola test products here before introducing them in the United States. Since January, Koreans have been able to watch television broadcasts on cellphones, free, thanks to government-subsidized technology. In April, South Korea will introduce the first nationwide superfast wireless Internet service, called WiBro, eventually making it possible for Koreans to remain online on the go � at 10 megabits per second, faster than most conventional broadband connections. South Korea, perhaps more than any other country, is transforming itself through technology. About 17 million of the 48 million South Koreans belong to Cyworld, a Web-based service that is a sort of parallel universe where everyone is interconnected through home pages. The interconnectivity has changed the way and speed with which opinions are formed, about everything from fashion to politics, technology and social science experts said. Chang Duk Jin, a sociologist at Seoul National University who has studied the effects of technology on society, said it had profoundly influenced domestic politics. Two years ago, after the opposition-led National Assembly impeached President Roh Moo Hyun, a consensus began forming on the Internet that the move was politically motivated � two hours after the vote took place, Mr. Chang said. There has been at least one unpredictable side effect: fierce witch hunts. In a case that caused national soul-searching, a woman riding the subway with her dog last year refused to clean up after it defecated in the car. One angry passenger photographed her with a camera-equipped cellphone and later posted the photos. Soon, all of wired South Korea seemed to be on the hunt for “Dog Poop Girl.” Several misidentified women were verbally attacked, and finally the woman herself was identified on the Internet and humiliated as the topic of countless online discussions. “Education has lagged behind the technology,” said Park Jung Ho, a professor of computer science at Sunmoon University here. The government, though, is pushing ahead relentlessly. It has drawn a precise timetable on specific technologies to develop or invent, one of them robotics. Mr. Oh of the Communication Ministry said South Korea lagged behind American, Japanese and European competitors in robotics but was aiming to be No. 3 by 2013. While other countries have focused on developing military, industrial or humanoid robots, he said, South Korea decided three years ago to develop service robots that, instead of operating independently, derive their intelligence from being part of a network. Late last year, three types of robots were distributed to 64 randomly selected households, as well as two post offices, with mixed results, Mr. Oh said. In October, a second phase in the testing will put robots in 650 households and 20 public places. 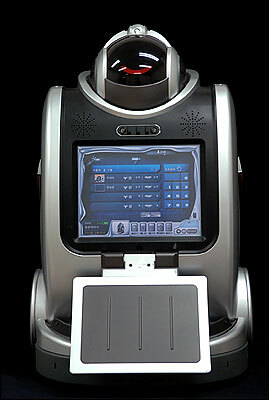 By 2007, the networked robots are expected to be on the market. Yujin Robot started developing prototypes in 2004 and has sold 100, mostly to universities and research institutes, said Shin Kyung Chul, the company’s president. It is the leader in making small, $500 robots that move around the house using sensors, vacuuming or sweeping. They have become popular gifts for newlyweds. What i don’t realize is if truth be told how you’re no longer really much more neatly-liked than you may be now. You’re so intelligent. You already know therefore significantly when it comes to this matter, made me in my view believe it from a lot of various angles. Its like women and men don’t seem to be involved except it’s something to do with Woman gaga! Your individual stuffs nice. Always maintain it up! Previous post: HP iPAQ hw6900 Unveiled…..
Next post: Will AMD Retain its Performance Crown in 2006?? ?